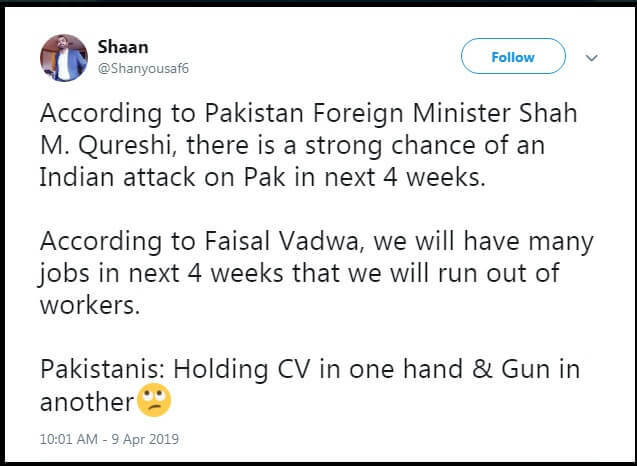 Faisal Vawda Claims Pakistan Will Experience Burst Of Jobs In 7-10 Days And People Can't Stop Trolling Him! 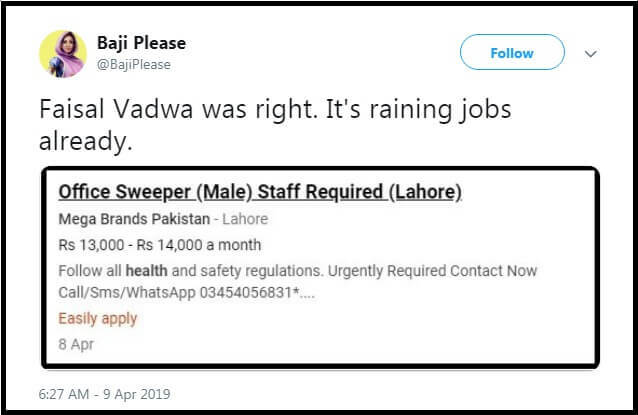 Faisal Vawda Claims Pakistan Will Experience Burst Of Jobs In 7-10 Days And People Can’t Stop Trolling Him! Federal Minister for Water Resources Faisal Vadwa claimed in a live TV show that there will be a burst of jobs in Pakistan in next 7 to 10 days. He also said that there will be so many jobs that they will exceed the number of people. Talking to Hamid Mir in Geo News programme Capital Talk, Faisal Vadwa that there will be a dearth of people with so many jobs very soon. He also predicted that the stock market and industrial sectors will get improved as well. “So many jobs will be created and I am not talking about years but a week, ten days, two weeks or four weeks in which this will happen. The living standards will be so great that paan walas and hawkers will offer to pay taxes,” Faisal Vadwa added. He also said that he can be challenged if it doesn’t happen. Hamid Mir said that he would invite Faisal Vadwa after weeks in his show and if this doesn’t happen, he won’t let him make excuses. To which Faisal Vadwa replied, ‘You can butcher me.’ The minister said if foreign investors will be provided relief in tax, they will surely get attracted to Pakistan. He said that our government has caught PML-N supporters in the various departments of national institutions who were busy in failing the incumbent government. 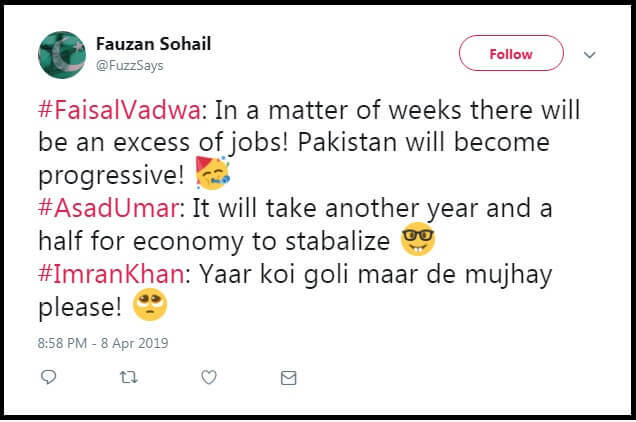 However, Faisal Vadwa’s Latest ‘Prediction’ Has Failed To Impress The Locals Of Pakistan! So, Faisal Vadwa Was Talking About These Jobs! Soon after getting trolled on social media, Federal Minister said in another interview that he is a man of word and his announcement about jobs in Pakistan is real. Speaking in ARY News programme, Faisal said to Kashif Abbasi that people criticize me for making such statements and call me ‘crazy’ or ‘high on something’. Faisal Vadwa Took A U-Turn And Switched 5-7 Days To 5-7 Weeks While Talking To Kashif Abbasi! On the other hand, The International Monetary Fund (IMF) has expressed its fear in their latest report that the economic conditions of Pakistan may further decline in 2019, resulting in the ‘slowdown of economic development and increase in unemployment’. It has been stated in the report that unemployment would remain 6.2 percent in the current year, while it would increase to 6.2 percent next year. So who is telling the truth? IMF or Faisal Vadwa? We can just wait for the next five weeks to see if Faisal’s prophecy is genuine or the IMF’s report!